Flying with a pet is extremely stressful for both animal and owner alike, so a number of major airports across the country are taking steps to make the experience easier and more enjoyable. Travel rewards website Upgraded Points compiled a list of the best airports for dogs, ranking facilities on amenities such as expansive areas for pets to relieve themselves and onsite spas. The award for the best onsite dog park goes to Reno-Tahoe International Airport, which has two parks complete with space to run and play and a covered area for when the weather isn’t favorable. 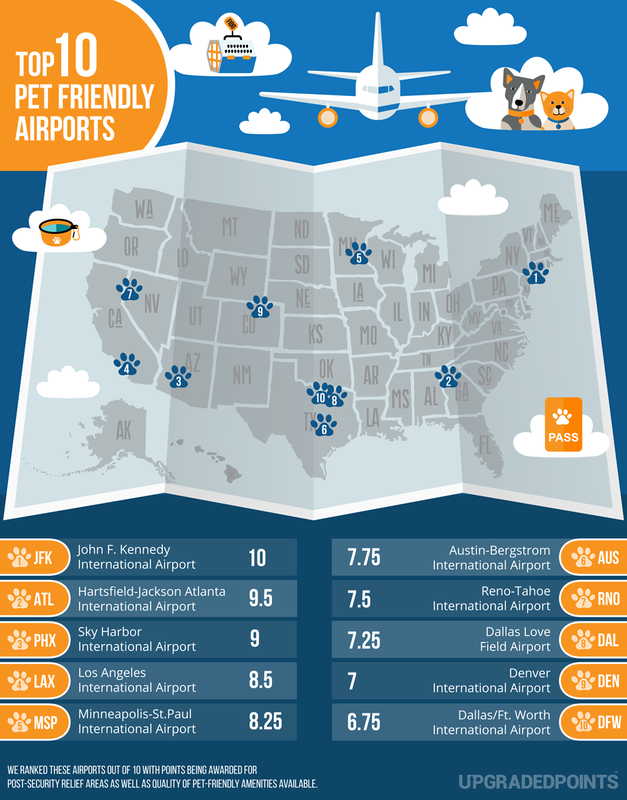 But no airport offers more overall services for pets than New York’s John F. Kennedy International Airport. Its terminals have park-like pet relief areas complete with benches and flora. To top it off, JFK has onsite veterinarian care for a wide range of animals, from house pets to livestock and exotic species, and Terminal 8 has what’s known as “the wooftop,” where you can relax with your pet post-security before boarding. Denver International Airport brings a taste of the famous Colorado outdoors to its pet relief areas with large mountain-themed murals. But the real highlight, and what earned DIA its spot in the top 10 is its luxurious pet-boarding facility, Paradise 4 Paws. If your dog fancies a swim in a bone-shaped bath or needs a bit of personal attention, DIA is the place to hit. Texas stands as the best state overall for furry fliers, with Austin-Bergstrom and two Dallas airports placing in the top 10. Austin’s airport features a dog drinking fountain in its famed “Dog Walk” area and gives stressed passengers the chance to cuddle with therapy pets to soothe their nerves. Dallas Love Field offers a pet park big enough for dogs to get in a run or game of fetch before a flight, while Paradise 4 Paws has a location at Dallas Fort Worth similar to the one in Denver.